Place cream cheese spread in small bowl; mix at low speed with electric mixer until softened. Add yogurt; mix at low speed until well blended. Stir in fruit mixture. Cover and refrigerate at least 1 1/2 hours or overnight to soften and plump fruit bits. Serve dip in individual bowls with apple slices. Serve dip in individual bowls with apple slices. 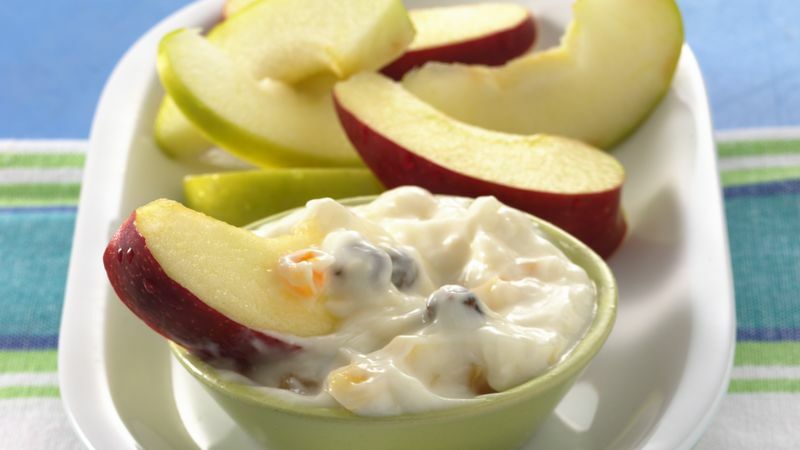 Can you think of some other foods to dip into this fruity dip? How about orange slices or pieces of pear? Try sticking grapes on a toothpick and dunking them into the dip.